IFAW's Marine Mammal Rescue and Research team, formerly the Cape Cod Stranding Network, responds to animals in crisis along 700 miles of coastline in southeastern Massachusetts, an area known internationally for the high number of whale and dolphin strandings. We are one of fourteen organizations comprising the Northeast Regional Stranding Network, which ensures expert, rapid response along the entire coast from Maine to Virginia. IFAW supports dedicated teams of highly trained individuals committed to promoting the conservation of marine mammal species (dolphins, whales, porpoises, and seals) and their habitats. IFAW also addresses large whale entanglements. In Canada, we are a critical supporter for the Campobello Whale Rescue Team. On the West Coast, IFAW supports the California Whale Entanglement Team – an organized team of local and regional marine mammal professionals who have received special training to respond to large whale entanglements along the state's coastline. IFAW also contributes its expertise on the issue of marine mammal rescue around the world. We have devised comprehensive protocols for rescue operation process and analysis and have participated in studies to link causes to mass strandings, such as the 2008 stranding in Madagascar, which can now be linked to a survey vessel using a multi-beam echosounder system. IFAW seeks to gain as much knowledge from these events as possible, conducting field health assessments, ultrasounds, hearing tests, and satellite tracking, both to benefit individual animals and to learn more about their populations and the ocean environment in which they live. Our collaborations with a diverse group of international scientists helps further this research. IFAW is developing one of the first systematic, mass stranding prevention programs in the world designed to avert strandings before they happen. As soon as we receive word that whales or dolphins are swimming in dangerous locations, the team hits the water in boats equipped with special high frequency acoustic devices called “pingers”. The pingers produce a harmless underwater noise that acts as a stimulus so the animals can be herded to the safety of deep water. 2011: Satellite tagging project shows that healthy single released cetaceans can survive. 2002: CCSN responds to a major mass stranding of pilot whales during the summer. 2002: CCSN receives authorization to perform stranding work. Prior, it was done under the New England Aquarium’s authorization. Frequently Asked Questions (FAQs) on strandings; dolphins, porpoises, and whales; and seals. 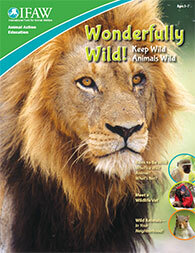 Go wild with IFAW's lesson plans on wildlife for K-8! The Keep Wild Animals Wild lesson plans, videos and worksheets explore what makes an animal wild, why we need to keep wild animals wild and how we can help protect wild animals from the threat of wildlife trade. You will find these and a wealth of other free, multi-lingual educational resources from IFAW’s Animal Action Education program via the regional links to your left.